FORWARD OPERATING BASE SALERNO, Afghanistan – Third Battalion, 3rd Marine Regiment, “America’s Battalion,” formally took control of Area of Operations Trinity Nov. 25, relieving 3rd Bn., 6th Marine Rgt. in a transfer of authority ceremony here. On the small basketball court turned parade deck, in front of Combined Task Force Thunder’s commanders and guests, 3/6’s colors were symbolically cased, and the red and gold of America’s Battalion’s colors were uncased and unfurled in a combat zone for the first time in over a decade. Army Col. Gary H. Cheek, commander of CTF Thunder, spoke both to the professionalism and effectiveness of 3/6 and his high expectations for America’s Battalion. 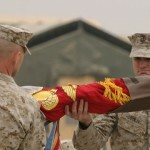 Cheek lauded the Marines for their near-seamless integration into Task Force Thunder. The combined joint task force approach to warfighting has been key to the successes of Coalition Forces operating in AO Trinity, according to the commanders of Thunder. Cheek and others spoke glowingly of how the integrated forces have not only crushed enemy resistance, but done so in such a way that the people of Afghanistan have been given the opportunity to rebuild their country in the climate of free democracy. The success that 3/6 was able to build included over 2,000 combat patrols, $600,000 in commander’s emergency relief funds spent for projects benefiting Afghans and the oversight of the first democratic presidential election in Afghanistan’s history. Cheek said the 3/6 Marines could redeploy knowing that they made a real difference as an agent of history. goal for his battalion, Lt. Col. Norm Cooling, 3/3 commander, spoke warmly of his Marines’ abilities and spirits during a recent interview with Honolulu media. As to working with the Army, Cooling said he was happy to be working with the 25th Infantry Division, based out of Schofield Barracks on Oahu. “They’re our Oahu Ohana. We just had to go to the other side of the world in order to work with them,” said Cooling. As the ceremony closed, the relief and pride of the 3/6 Marines was almost as palpable as the spirit on the faces of America’s Battalion’s Marines. Cooling closed by speaking directly to his commanders in a message that couldn’t have been clearer. FORWARD OPERATING BASE SALERNO, Afghanistan – Service members and civilians began their Thanksgiving here by kicking up some dust during the Thanksgiving Day 10k Rocket Run. Runners wound their way around the heavily-barricaded perimeter of FOB Salerno, some in five-person teams, some running in formation with their units and others running solo. The competitors were vying for certificates of achievement, unit coins and other prizes. To a casual observer, however, what was really on the line were bragging rights among the units and services participating. participating in a “just for fun” event. In fact, everyone’s spirits were high as runners passed each checkpoint, dousing themselves with cups of water and cheering each other on. Other runners agreed, happy to share the morning with their fellow service members. McCombs posted one of the fastest times of the day, just behind the winning runner, Cpl. Aubrie Solomon of 3rd Bn., 6th Marine Rgt. The elevation left many of the newly-arrived runners a little more winded than they thought they would be, breathing heavily through the hazy morning. “It felt a lot longer than 6.2 miles,” said Lance Cpl. Jason Stenzel, from a tactical network specialist with 3rd Bn., 3rd Marine Rgt. The Rocket Run earned its name from the now waning insurgent rocket attacks on FOB Salerno. In recent months, the presence of the Battery F, 7th Field Artillery Regiment’s “big guns” and the positive effects of service members’ presence in the local community has deeply eroded support for insurgency against the Afghan government and coalition forces. Another run is scheduled for the upcoming holiday season. Leane Hensley received the letter more than a month ago, before the offensive on Fallujah in Iraq began. It was from her 23-year-old husband, Lance Cpl. Nicholas Hensley, a Marine with the 1st Battalion, 3rd Regiment, and the last time she has heard from him. “Do not open unless I’m dead,” he had written on the outside. The Hawai’i unit was in the thick of fierce fighting to retake the rebel-held city. Sixteen 1st Battalion, 3rd Regiment Marines have been killed in Iraq — all but one in the Fallujah area. Hensley knows Alpha Company hasn’t been relieved, meaning her husband wouldn’t have had the chance to contact her, and computers were shut down for a while. In the meantime, she watches CNN and checks online with the same mix of hope and dread experienced by other spouses. “Just to get a glimpse of him would be nice,” the 21-year-old Massachusetts woman said. Wives like Hensley, and Marines in Iraq and Afghanistan, are going through that type of uncertainty during what is traditionally the most family-oriented times of the year — the holidays. At a time when most families make every effort to get together, combat in two war zones is keeping 2,000 Marines and their families apart. But largely — with Marines supporting Marines, families supporting families, a liberal dose of community help, and an abundance of gung-ho pride — they are able to cope. “They (the holidays) are sad, but you have the support that you need with the wives, so it kind of takes your mind off of it a little bit,” Hensley said. She had planned to play host to five wives and eight children at her home on the Marine Corps base at Kane’ohe Bay for Thanksgiving. She’ll have a similar gathering at Christmas. For Hawai’i Marines, many of whom are on their first combat assignment, recent duty in Iraq and Afghanistan is the chance to write their names in the history of Marine Corps lore. In 1991, about 7,600 Kane’ohe Marines were deployed during Operation Desert Storm, and Hawai’i Marines with Task Force Taro were the first to cross the mined Kuwait-Iraqi border. There had not been a battalion-size presence of Hawai’i Marines in the Middle East until late August, when about 1,000 Marines with the 1st Battalion, 3rd Regiment crossed into Iraq from Kuwait. That has been followed by the deployment of another 1,000 Kane’ohe Bay Marines with the 3rd Battalion, 3rd Marine Regiment to Afghanistan this month. Although many Hawai’i Marine families are adjusting anew to war and sometimes death, the Army’s 25th Infantry Division (Light) has become agonizingly accustomed to it over the past year. The deaths Wednesday of Cpl. Jacob R. Fleischer, 25, and Cpl. Dale E. Fracker Jr., 23, in a roadside bomb attack represent the eighth and ninth fatalities for the division in Afghanistan, and brings to 20 the number of Schofield soldiers to be killed in two wars since early this year. Already, Hawai’i Marines have been the target of attacks — but no injuries — in southeast Afghanistan, where the 3rd Battalion is responsible for six provinces. Petty Officer Michael Subee, 25, a 1997 McKinley High graduate who is senior line corpsman for Headquarters and Service Company, was used to alternating Thanksgiving and Christmas with his and his wife Brandi’s families in Waimanalo and Niu Valley. The couple has a 6-year-old son, Aramis. “It’s definitely rough (missing the holidays), but my wife’s a really strong woman and she has support from both sides of the family, being that we’re both from Hawai’i,” he said. Second Lt. Paul Makani Christensen, 24, a supply officer with Headquarters and Service Company who grew up in Hilo, Hawai’i, said that some years he would make an imu with his family for Thanksgiving and eat turkey, lau lau and fish. This Thanksgiving was spent at the FOB Salerno chow hall. For the 1st Battalion Marines in Iraq, the holidays come packaged with the loss of 16 lives in a month’s time. Seven Hawai’i Marines were killed in a suicide car bombing near Fallujah on Oct. 30. “You open the door very slowly,” she said. The worry and loss hits families hard, and sometimes when they least expect it. For one past deployment by her husband to Okinawa over the holidays, Hensley was with family in Massachusetts. On another, he made it home for Christmas. “This is going to be the first time without anyone here with me for the holidays besides the kids,” she said. Other wives will be thinking of her, though, and she’ll be doing the same. If she goes to the store, she checks to see if others with children who can’t get out of the house need anything. “You’re constantly checking up to see if they need anything — especially the pregnant wives. We have a lot of pregnant wives,” Hensley said. The greater Hawai’i community also has tried to do its part. Redemption Academy in Kailua donated 60 turkeys to the families of the 1st Battalion, 3rd Regiment Marines for Thanksgiving. At the Creekside tavern in Kailua, owner Shawne Garliepp brought in two turkeys, two hams and all the trimmings for her loyal Marine Corps family. About 70 percent of her business comes from Marines, and Corps memorabilia — including a photo of a tank in the Middle East with a Creekside T-shirt displayed on one of its treads — adorns the walls. “We’ve got guys who’ve left Hawai’i for seven to 10 years and now they’re back and here (at Creekside) again,” Garliepp said. Over the years she has gotten to know many Marines, but not understand them entirely. One gunnery sergeant in Iraq has been able to call the tavern most Sundays. “He’ll call and say, ‘Hi, who do you know in Iraq?’ And I’ll say, ‘A lot of people. Who’s this?’ ” Garliepp said with a laugh. The gunnery sergeant served in Iraq, came back and deployed again with the 1st Battalion, 3rd Regiment. But her Marine Corps customers do. “Guaranteed, those Marines out there, they’d love to be with their families during the holiday season, but they wouldn’t give up the opportunity to be where they are at now, being part of the change, helping Iraq change, helping Afghanistan change,” said Gunnery Sgt. David Pangelinan, who is with Headquarters Battalion at the Marine Corps base. Pangelinan, 33, who was born in Hawai’i and lived in Kunia until he was 5, was in Iraq twice: in 1991 and again last year, both times with the 1st Battalion, 5th Marine Regiment out of Camp Pendleton in California. The second trip took him through Baghdad and Tikrit, and he has a picture of himself sitting on Saddam Hussein’s bed in one of his palaces on the Tigris River. Hensley’s husband has the same kind of pride. Staff Sgt. Jonathan Brown, 27, an active-duty staff member of the 4th Force Reconnaissance Company, a reserve unit at Kane’ohe Bay, said the 1st Battalion, 3rd Regiment Marines have made a name for themselves in Fallujah. Copyright © Honolulu Advertiser 2004. LtCol Norm Cooling. FOB Salerno, Afghanistan. November 2004.